Tarantino fatigue has set in ; what made him hip now makes him seem like a gimmick prone stylist living up to fan expectations; I think of good amount of Fellini when the subject of Quentin arises. Is destined to make a million motion pictures the contents are familiar to the point of contempt? There is a strong chance, unless Hollywood runs out of money first. Even Pulp Fiction, his best effort, seems dog eared just as Citizen Kane seems over stuffed. PB movie will hang around Tarantino's head for as long as he lives because it will be regarded, always, as the best thing he's ever done. It remains a powerful film for the most part, full of wicked laughs and and re-convolutions of seamy paperback action novels, but it does shows it's age. The dialogue is something... else altogether, but does anyone really think he's done better than the Master, Elmore Leonard?The dialogue ,as such, are extended riffs divorced from the violence and action, a sort of virtuosity that is more obtrusive than revealing; the beauty of pulp fiction was that its minimalist discussions, compact, jargon filled, quirky and redolent in references that suggested a sub culture beyond the melodrama of ...the basic plot, were models of sledge hammer concision. The dialogue here merely stalls, stops, occupies time like it were a waiting room. Seeing these characters again go on about the differences in burger joints between Amsterdam and America, the finer points of foot massage and revenge, on changing one's way of life due to a revealed miracle, makes you wish something would happen that was gratuitous and without justification. Anything to get on with it. 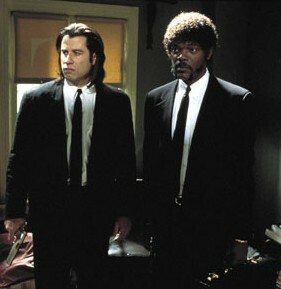 Pulp Fiction is a movie about movies, specifically the lurid, grindhouse kind. It’s clever and funny in spot, but less aesthetically nutritious than the hamburger Uma Thurman refuses to eat in the nightclub scene. The droll scenes – like the ones with the masked creep on the chain or Harvey Keitel as the Wolf – are very cute and clever in a wink-wink, nudge-nudge grad student bull session sort of way. It strokes one’s smartypants quotient very effectively. But ultimately, the movie lacks the twisted innocence of the sincerely sleazy and lowbrow films Tarantino reveres. And it’s painful and fairly insulting to watch when it even approaches trying to MEAN something.